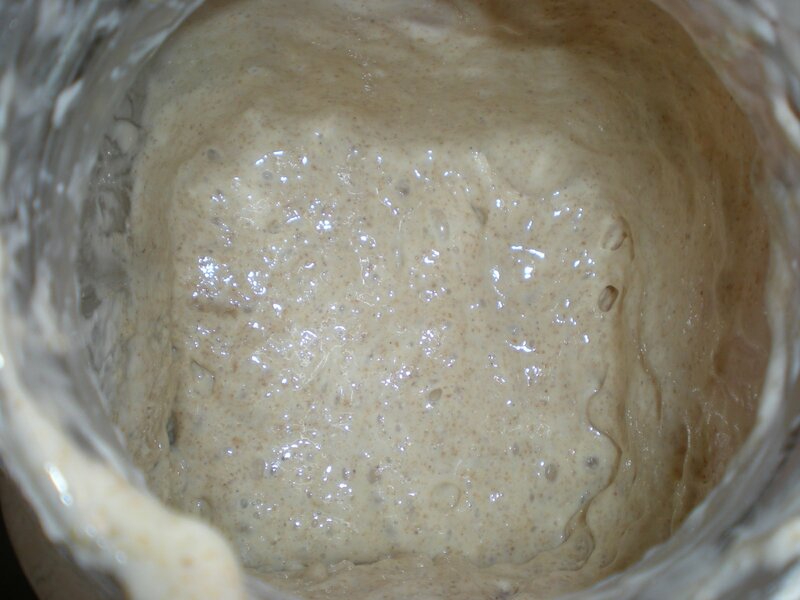 First, I would like to apologize in advance for what is perhaps an overly technical, and certainly rather boring post to those unitiated in sourdough culture (sorry also for the terrible pun). 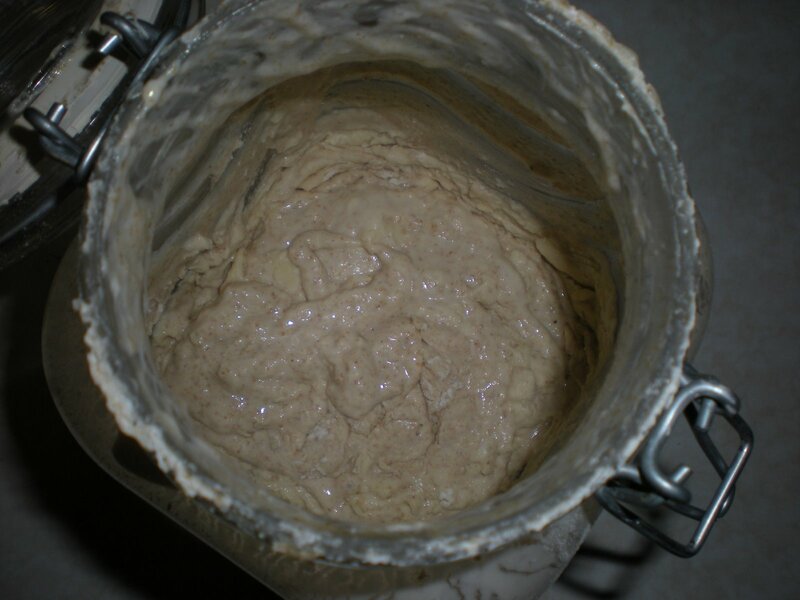 I have been baking with a sourdough starter for nearly a year now. 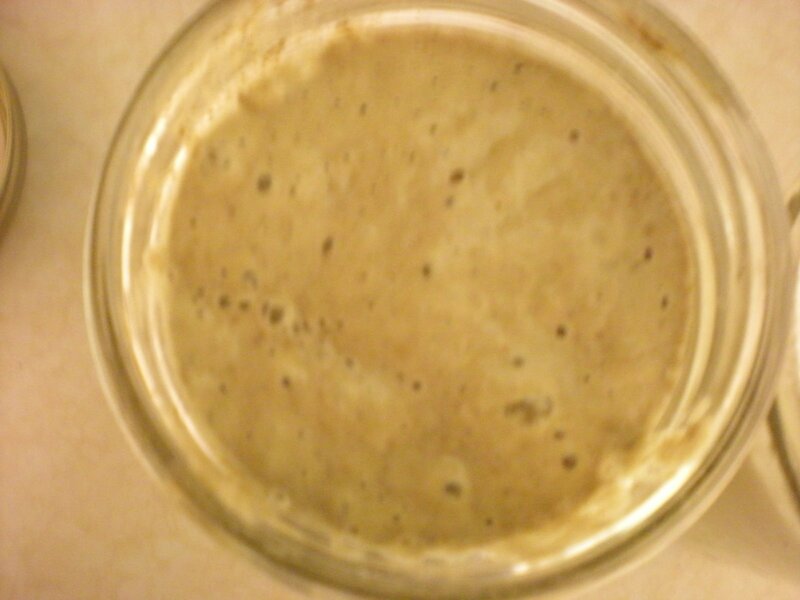 As regular readers know, I began my starter using leftover yeast from Mr. Bread Maiden’s beer brewing activities, instead of the typical Reinhart “pineapple juice” formula. This allowed for the yeasty beasties (technically S. Cerivisiae) to procreate and become usable much faster. And life has generally been grand. I keep two starters, at 100% and 75% hydration, and keep them in the fridge until the day before I need them, when I build them back up on my kitchen counter. However, last week things took a turn for the worse. My mother in law (Slow Learner, her self-given blog nickname, not something I would ever call her since she is wonderful) was helping me make sourdough. In anticipation of her arrival, I transfered my starter (which I had previously kept in a small Ball canning jar) into a very large pickling jar so I could build up a large amount of starter that we could use. Since I was busy with other breads, I gave her the ratios for my fail-safe (or so I thought) 1-2-3 Sourdough. We left the dough to sit overnight, doing several stretch-and-folds to strengthen the shape. Each time, it was forming a stronger ball of dough. All seemed to be going well. Then, for the final shape, something went terribly wrong. Every time I folded the dough, it became stickier, goopier and harder to manage. It stuck to everything, no matter how wet my hands were or how much oil we used to grease the bowl. It was like there was no gluten at all. It was awful. We tried adding tons of flour at the very end, but this resulted in a crumbly dough with no flavor. I initially thought that maybe the 1-2-3 ratio aspect of the dough had left my poor MIL confused and that the ratios of flour, water, and starter had gotten mixed up. It certainly did not look like 66% hydration dough, or even 75% dough. It was liquidy and not firm. But the facts didn’t make sense; it had acted like firm dough when we had mixed the ingredients and throughout the process until the end. When I tried to make sourdough again, it ended up sticky and flat, just as before. Clearly, something was wrong at some stage in the process. But what? I made other doughs with commercial yeast that ended up just fine. So the problem wasn’t the flour or water. The problem was definitely with the starter. I went online to my favorite discussion blog, thefreshloaf.com. There, forums can answer any question you have about anything to do with bread. Apparently, if starter is left too long without being fed, it develops the ability to eat protein (becomes proteolytic), i.e. gluten. 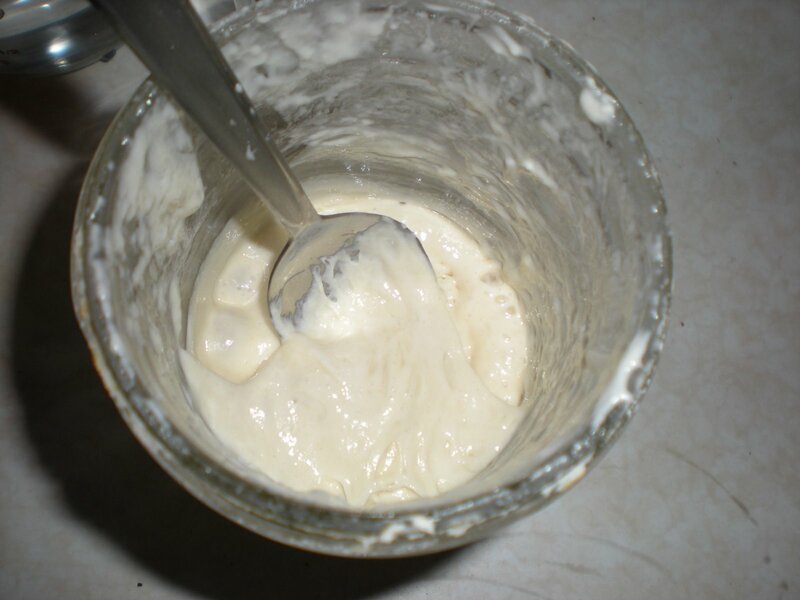 The starter becomes too concentrated with yeast, and it begins feeding on the protein at an accelerated rate. So, there were several problems at work here. 1. 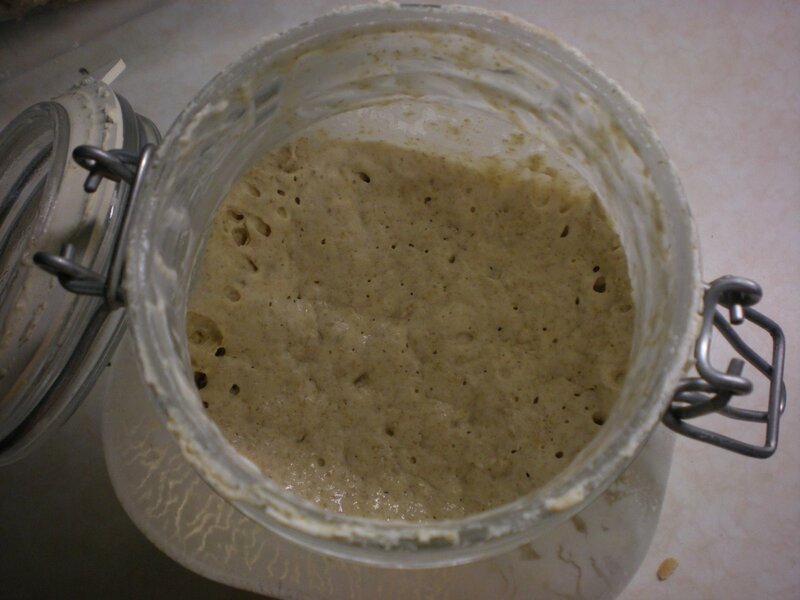 Moving the starter to a larger jar caused a concentration of yeast since I was not giving it enough flour to feed on at each feeding. 2. Because I had such a large jar of yeast, I was keeping it on the kitchen counter but not feeding it as frequently, leading it to develop the ability to eat protein. It also led other, more acid-tolerant strains of yeast, to thrive instead of the nice, yeasty-smelling yeasts that had been cultivated. This gave it the smell of acetone, or cheap nail-polish remover. So how did I solve this problem? Well, it’s not that simple. We are currently monitoring the starter to see if it recovers. If not, then I guess we will be returning home starterless (here’s hoping my MIL, who I gave part of my starter to during her most recent visit, will loan me some back). From the fresh loaf, I have gained the following insights to taking care of a sick starter. 1. Reduce the amount of starter you keep replenished. This meant dumping out a good deal of starter, and continuing to dump out about half the starter per day. 2. Keep the starter on the kitchen counter for a week, keeping a strict feeding schedule of one or two feedings a day. At each feeding, pour some out before replenishing it with flour and water. 3. 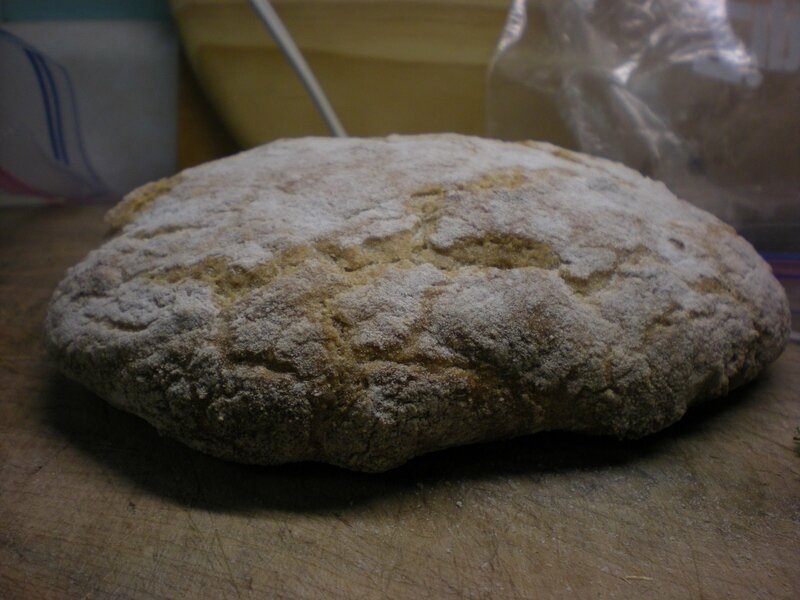 Mix in a bit of rye flour into the usual feeding to generate enzyme activity. This is kind of like distracting the yeast from eating the protein. So far things have already improved and the starter is much firmer than before and very active and bubbly. I will keep people notified if the situation improves. My starter behaved beautifully! I haven’t yet developed a level of comfort with it, but I’m sure that will come with time!